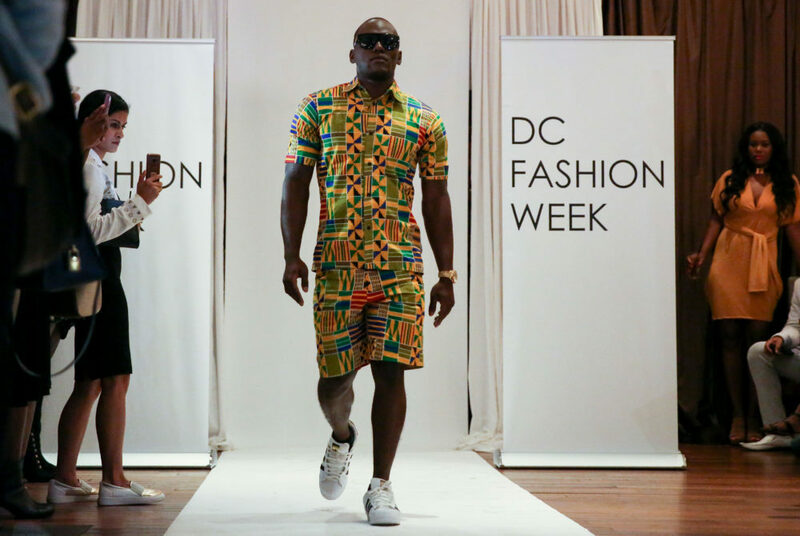 Patrick Amara walks the runway wearing Obioma Fashions – a family company run by two brothers, their sister and their father – at D.C. Fashion Week. The opening show at D.C. Fashion Week Thursday featured students at area colleges who had to strike a balance between schoolwork and sewing to create their fashion lines. The NextGen fashion show featured 14 designers who are currently enrolled in college while working on their fashion lines. The students come from schools in and around D.C. – like Howard University, Moore College of Art and Design and George Mason University – and have an eclectic mix of majors ranging from business, to chemistry to fashion. Ean Williams, who founded D.C. Fashion Week 27 years ago, said it’s a “privilege” to give new designers a place to showcase their talent during the annual fashion show. D.C. Fashion Week consists of four shows – the Eco and NextGen fashion show, the international fashion show, the emerging and indie artists showcase and the international couture show. Ciarra Mariah, a junior at Howard University majoring in business, showcased three dresses which varied from a edgy, sleek dress to a piece that was exotic and patterned. Mariah said she got involved in fashion week to showcase her designs. Models at the NextGen fashion show prepare to hit the runway Thursday at Dirty Martini. All of Mariah’s designs resembled the first dress she made as a child, in terms of color schemes and fabrics with a collection of cocktail dresses. The first design was a sequined bandeau paired with a satin wine colored skirt, and another was a dress made with multicolored printed satin and deep back. There were about 30 models showcasing the students’ designs. 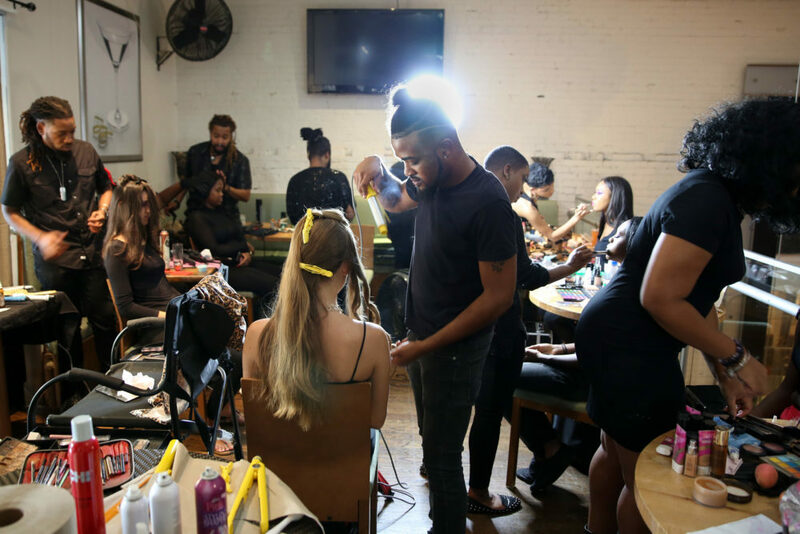 Some of the models are also students themselves at schools like Trinity Washington University, George Mason University and University of Maryland at College Park. Last year, junior Jared Axelowitz walked the runway in the menswear and international couture shows, but no students from GW participated in the show this year. Karyn Kittrell, the designer behind Karyn K Fashions and a sophomore at Moore College of Art and Design in Philadelphia, grew up competing in pageants. She said she started designing at 12 years old and since then, a career in fashion has always been her ultimate goal. Kittrell said she often creates pieces that transform from one article of clothing into another. She showed three designs from her Captain Scarlett Collection, the most memorable of which was a pink skirt with 450 vintage keys sewn onto it. When the model walked down the runway, she undid her skirt to reveal pink pants underneath. “A lot of my collection is things around me which inspire me,” she said. Her work has also been featured in the Baltimore Fashion Week and the Atlantic City Fashion Week. Another group of designers to showcase their work at the fashion show was Obioma Fashion – a family company run by two brothers, their sister and their father. Emeka Goz Anyadiegwu, the managing director, is a master’s student studying economics at Howard University. Obioma Fashion’s entire line is based off of the family’s Nigerian heritage. Emeka Anyadiegwu said they want to mix African patterns with Western style to produce something distinct. At the show, they presented 18 pieces, including three looks for men and 15 looks for women. They were the only designer at the NextGen show to present male clothing. The mix of colorful, cultural patterns on traditionally American clothing helped the brand spread their message about the beauty of African culture, Emeka Anyadiegwu said. “Our goal is to promote a positive culture and make people aware of African history,” she said.